I'm surprised by the reviews this got, because I didn't think it was particularly good. Basically, the writer puts a group of 'colourful' characters on a spaceship and sends them off on a long journey. Along the way, various unconnected events happen, with each crew member in turn taking centre stage. This makes it feel like a series of episodes rather than a continuous story, and it's made worse by the author stopping the narrative at frequent intervals to explain what the characters are feeling and why, or the background to their species, or some political history. It's very much 'tell not show' and I didn't feel any real connection or empathy with any of the characters. The bit when they finally arrive, which I had mistakenly expected to be the main point of the story, was skipped over quite quickly, and I found it anti-climactic. As some other said, it is definitely the cozy side of SF. Personally I prefer more edge. 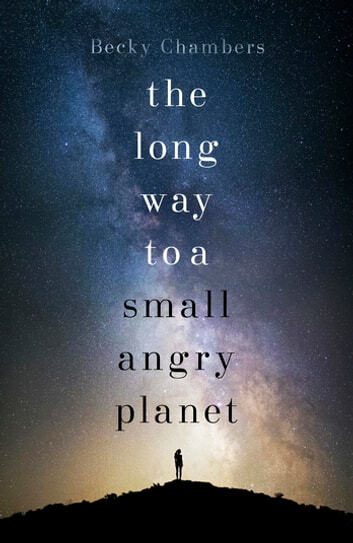 If you want character-led space adventures with an interesting, engaging story, you could do much worse than try 'The Long Way to a Small, Angry Planet'. The story held me rapt, as I wanted to know what was going to happen next. So much so, that I almost went over the time in my lunch break. Sorry, boss! Rosemary has signed up to crew on a tunnelling ship - a vessel creating wormholes, enabling traffic across the galaxy. But she is also running from her past. Then again, everybody has some little secret in their life, and everyone has issues. Ashby, the captain, is lousy with admin, which is why he's hired Rosemary. Corbin, who tends the algae fuelling the ship, is a misanthropic loner. Doctor Chef is giving and caring, with the weight of history on his shoulders. Sissix, the pilot, has her own hidden depths. And so on. These 'issues' and the well-crafted personalities are the facets which bring the characters to life, and take the reader into the story. Little by little, the story unfolds as they crew cross the galaxy on the biggest, and most profitable, project in their life. The characters grow, and the dynamics of alien and human interactions, paint a picture of the universe the author has created in vivid colour. I loved that this story didn't have humans as the most important beings in the galaxy. The Galactic Council is no Earth-based Federation of Planets. It's out 'there', with humans only coming to it recently in the grand scale of things, and with no special privileges. I loved how it showed different family dynamics: aliens who are not human in attitude; humans who have had to adjust to new planets; people who have had to make their ties to those around them, and try to remain close to others separated by the expanses of space. I also enjoyed the ideas in this book: the concept of travelling vast distances, and that there would need to be specialists to create the 'tunnels' and highly adept navigators functioning on another plane; and that there would be hazards and strangeness beyond the ken of our normal existence. But, this is not a perfect book. Is any book perfect? There are a few infodumps, including a couple of speeches. I was able to overlook them for the most part, though, as the richness of the story compensated. And they were not overpowering. The flow also occasionally jarred. The chapters were slightly episodic, with some things too neatly parcelled off. However, the greater story arc paid off, so the minor flaws were vastly outweighed by the many positives. In fact, my biggest complaint was that it ended. I wanted more. I wanted to stay with that crew. Hell, I wanted to be a part of that crew! If you like well-written space opera, or science fiction in general, give this book a go. If, like me, you grew up with Star Trek, or are a fan of Firefly, then I think you could love this. A solid 9/10. I will be reading more of Becky Chambers' work. This was a fantastic read; both my girlfriend and I enjoyed the characters and the world that Chambers has created. This work is more on the light-hearted side of science fiction, and by the end of the novel we were completely invested in the fates of the crew. We desperately want a sequel! Upbeat, contemporary, and hilarious in parts too! Usually books full of nice people are cloying and false, but this one works. The imaginative power of it, the fantastic use of dialogue, the multitude of narrative points of view all combine to make it a great read. The story's a little schmaltzy, but meh - I'll take schmaltz with good writing over badly-done noir any day. 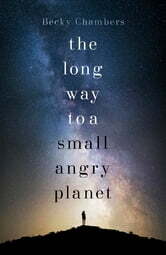 A long journey to a small angry planet. I have read many sci-fi books during the past 50 years and this is an approach to the subject that is new to me. Combining personal relations, politics and a variety of technologies in a very human story even though many of the characters and species not human. It is a very intriguing and thought provoking story. MORE PLEASE.